From the bloopers file: the 1611 edition. 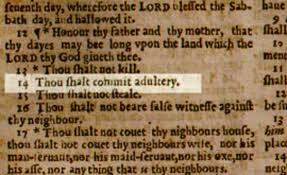 “A rare copy of the notorious seventeenth century ‘Wicked Bible’, which shocked readers by exhorting them ‘Thou shalt commit adultery’, is to go on public display for the first time. Cambridge University has opened an unseen section of its library archives to the public to display a collection of rare religious texts. The exhibition, which opens today, is centred around the King James Bible of 1611 – widely regarded as the most influential book ever written in English. However it will also feature a 1631 edition of the Bible in which the word “not” was accidentally omitted from the commandments, earning its printers a public rebuke from the Archbishop of Canterbury. The books were mostly destroyed and only a handful of copies survive.” Read more here. This entry was posted in Uncategorized and tagged bible, bible editions. Bookmark the permalink.